The holidays are upon us, and we all know what that means—a month of indulgent eating and drinking. So, why not give yourself and your loved ones the gift of health this season by incorporating a little Mediterranean flair into your holiday soirées? Not sure how to eat the Mediterranean way? Simple! Just head over to your local grocery store and pick up Cat Cora’s Kitchen by Gaea products. 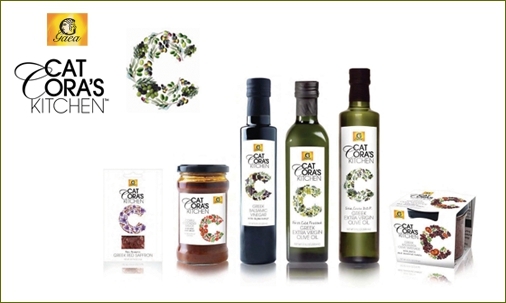 The Greek-American celebrity chef has teamed up with Gaea, an award-winning Greek specialty foods manufacturer to create her new line of gourmet olives, olive oils, vinegars, cooking sauces, tapenades and other authentic Greek specialties. All of the products are made from the finest ingredients and are 100 percent natural, free from artificial colors, flavors and preservatives. In 2005, Cat made television history by becoming the first and only female Iron Chefon Food Network’s Iron Chef America. Cat has authored three top- selling cookbooks, opened three restaurants and has launched hew own collection of cookware andwines. Cora is the co-host for Disney’s “Muppets Kitchen with Cat Cora” and “Hasty Tasty” webseries. Cora is contributing food & lifestyle editor for O, The Oprah Magazine. In 2004, Cora, an avid philanthropist and UNICEF spokesperson, founded Chefs For Humanity in response to the tsunami disaster in Indonesia. This non-for-profit organizationaims to provide nutrition education and hunger relief worldwide. *SNACK PACK, WHOLE KALAMATA OLIVES-Our whole Kalamata olives are sun ripened. The color ofeach olive varies depending on their exposure to the sun'srays while on the tree, with olives on upper, western branches getting the darkest color. *KALAMATA OLIVES- Coming from the Kalamata region of Greece, theseolives are plump, fleshy and full of flavor. The colorof Kalamata olives depends where they are locatedon the tree and their exposure to the sun. Cat Cora’sKitchen by Gaea offers Kalamata olives whole or pitted. They can be eaten on their own as a finger food, as an appetizer, or they can be added to casseroles and salads. I enjoyed both of these products, especially the snack pack. I love that they are a healthy snack for when I am on-the-go, which, face it- when aren't we all on-the-go?